A beach vacation just isn’t the same if you have to leave one of your four-legged, furry family members behind. Bringing your pet along with you on your vacation may take a little extra planning and consideration, but it’s totally worth it. So, what can you do to ensure you and your pet have the time of your lives during your beach getaway? Here are 10 tips that are sure to make it the best beach vacation ever. 1. Choose a pet-friendly beach vacation rental that suits both you and your dog. Obviously you’re going to choose a pet-friendly accommodation, but which one? You may be so focused on the amenities that you want, that your pet’s needs may be unintentionally overlooked. You might want to consider what amenities would make it more comfortable for both you and your dog during your stay. Does the pet-friendly rental offer an outdoor shower for quick and easy cleanup after a day at the beach? Is there an enclosed porch or deck where your dog can soak up the rays, slumber in the shade, and breathe in the salty sea air? Perhaps your dog prefers an ocean view? 2. Familiarize yourself with the local rules, regulations and leash laws. Getting to know the local beach, beach town, and what their pet policies are is a crucial element for a relaxing beach vacation with your pet. Dealing with a citation, fine, or even a verbal reprimand can quickly put a damper on your days in the sun. Preparing ahead of time by knowing what to expect, what is allowed, and when it’s allowed is so important. Read up on the local leash laws, town guidelines, and pet-friendly policies of all of the places you plan to spend time with your pooch. You can find the pet-friendly policies for Sunset Beach right here. 3. Introduce your dog to the new environment. Slow and steady. Easy does it. One step at a time. Good, dog! Take some time to introduce your dog to his new beach locale. Take him out when it’s not too busy or too crowded. Let him explore the sand, sun and surf on his terms. Don’t rush it. Give some encouragement and comfort as he gets used to his new surroundings. The same goes for his new vacation-home-away-from-home. Pick out a nice, comfy spot for him to sleep where he can be near to you in case he becomes unsettled. Bring some of his toys with you on your beach vacation so he feels at home in the rental. Let him sniff out the new digs and get acquainted. 4. Be mindful of the elements. When it’s time for your beach outing, be aware of what your dog is being exposed to throughout the day. Is the sand really hot? What about the parking lot? Is the heat index really high? Is the water rough and choppy? Is it a really bright and sunny day? Is there a rip current warning? 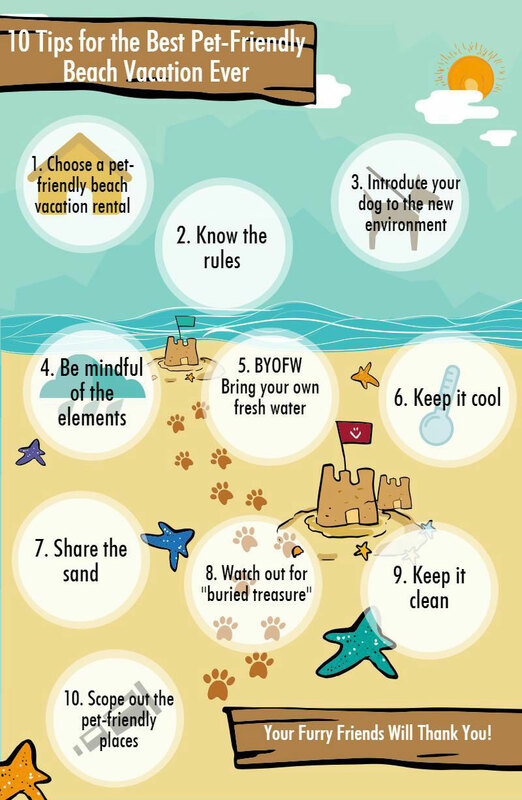 All of these things could affect your dog’s day at the beach. These only some of the considerations to think about. Just as you prepare yourself for the beach with sunscreen, sunglasses and appropriate attire; your dog’s needs should be considered as well. Be aware of the conditions and act accordingly. It’s in the best interests of your pet and your own peace of mind. Don’t count on there being a fresh water source for you to fill up your dog’s bowl. (Don’t forget the bowl!) Come prepared because fresh drinking water is very necessary. Bring more than you think you’ll need. Make sure your dog is actively lapping up the fresh water, staying hydrated and not consuming too much salt water. Salt water does a number on a dog’s digestive system, and it won’t end well for either you or your dog at the end of the day. This relates back to #4. Even a cool day at the beach still offers copious amounts of sunshine. 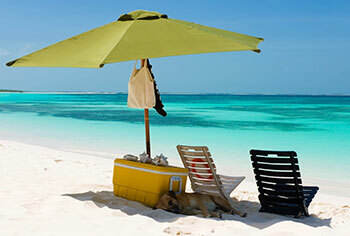 Give your dog a place to stay cool by bringing a beach umbrella or other source of shade. Consider bringing an extra towel or blanket for him to lie down on and get comfy, as the sand can be hot too. Speaking of keeping your dog shaded, it’s also a good idea to look into sunscreen products made specifically for pets. Protect those sensitive spots like the nose, ears, belly and groin area. This is especially true for short-haired and/or fair-skinned dogs. Don’t forget to reapply! You’re sharing the sand and lovely coastal space with others, so try to be considerate of your fellow beachgoers. Some will love your dog, and some will not. Make your time on the beach the best it can be by being aware of those around you. Even the most well-behaved dogs can become overly excited when they’re in a new and exciting place. Who doesn’t get excited about the beach? Err on the side of caution, and choose wisely. Be watchful of what’s going on around you and know your dog’s triggers. Keep the leash well-secured, just in case. 8. Watch out for buried treasure. The beach offers a lot of hidden treasures for your dog to sniff out. He may love to dig up the seashells, chase a crab into the water, or sink his nose into the sand. Just keep a watchful eye out for broken glass, fishing hooks, unidentified garbage, jellyfish and other items that could cause injury. Don’t let your dog’s curiosity end up ruining a fun day at the beach. Help him out by scouting out the surroundings and staying close by as he explores the coastal landscape. Don’t forget to clean up your dog after a day at the beach. Rinse off the saltwater, brush out any particles that may be lodged in his fur, and check his paws to make sure he didn’t step on anything sharp or hurtful. 10. Scope out the pet-friendly places. 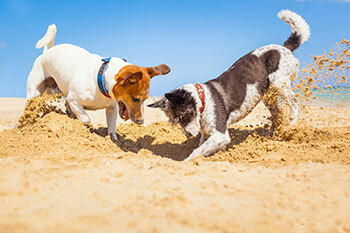 Your pet may want to mingle with the locals during his beach vacation. Check out the area pet-friendly hot spots, find some dog parks, and ask around for some great places for you and your dog to spend some quality time together. It’s also a good idea to know where the nearest veterinarian is in case of an emergency and any local pet stores that are close by in case you need anything. Check out the local markets, too. They often carry specialty pet items. Let’s throw in a few additional beach hacks that will make your dog-friendly day at the beach even better. Check these out! To soothe an upset stomach (saltwater, remember? ), give your dog some low-sodium chicken broth. Speaking of chicken broth, use an ice cube tray to freeze cut-up apples in chicken broth for a nice cool treat on after a hot day. Make an ice lick by freezing toys, treats, bones, and water (or chicken broth) in a cake mold. If you’re road-trippin’ it to the beach, a laundry basket with a blanket and a pillow makes a nice canine car seat. If you need a quick DIY dog toy idea while away, just put an empty water bottle inside a sock. Tie a knot in each end and voila! Instant crinkly-sounding dog toy. A squeegee or a rubber glove makes removing dog hair from carpets, car seats, and other surfaces really fast and easy. 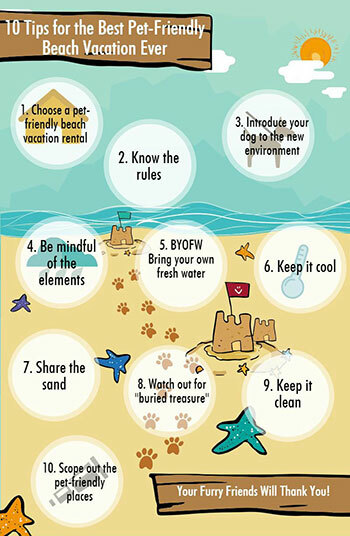 With these 10 pet-friendly tips, along with our doggy beach vacation hacks, you are well on your way to having the best beach vacation ever. You’re making memories that will last a lifetime and giving your pet a priceless gift. You can expect much gratitude and thankfulness reciprocated in the form of slobbery kisses, sweet nuzzles, and lots of tail wagging. Are you ready to start planning your next pet-friendly beach vacation? Start right here, right now.